It has often been stated, in scholarship as well as in popularly written articles about this dwelling quarter in Sarajevo, that this was a ghetto for the Sephardic community. This certainly perpetuates the view of the Jewish residential pattern existing in the West; that model, however, did not exist in the lands under Turkish rule. Separate quarters for Jews in the west of Europe arose after the devastating Black Plague of 1348. Those Jews who somehow survived were invited to settle again in the towns they had left, but under the condition that they reside in the quarters especially designated for them. That entire quarter would be closed at sunset so that Jews could not leave it nor, conversely, could Christians enter it. In Venice in 1394, the Jews had to wear a piece of yellow cloth on their chests, “the size of a small, four-dinar loaf of bread, with a large letter ‘O’.” That city gave the world the noun “ghetto”: in 1516, Venetian authorities forcibly settled then city’s Jewish inhabitants in a quarter near the Ghetto Novo—the new iron foundry… . Nothing like that applies to Sarajevo. It seems that the Velika avlija or il Kortižo was not even built specifically for the Jews … One thing is certain, and that is that only the poorer among the Sephardim resided in il Kortižo … while others, the better-off, were scattered throughout numerous Sarajevo mahalas. 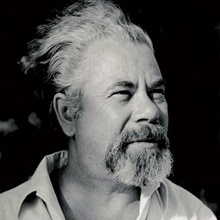 In this connection, we should not forget that Jews like to live and reside together… [T]he Bosnian Sephardim have a saying illustrating this attitude and desire of theirs for living together, alongside one another: al kazalito medio blahito, that is, a Jew who lives in the country is already half-Christian. This bespeaks the fact that he who lives alone, is distanced from his community, nation, and faith. The number of the Sephardim constantly rose with the development of Sarajevo, not only through natural population growth but also through the influx of newcomers. Some came from the neighboring Dalmatian towns, attracted by a possibility of earning their living, but most came drawn by religious freedom; others came with the Muslim populations leaving the regions that the Turks had been abandoning because of war circumstances. That is how— although much later—the families of Tolentino, Krispi, and De Mantova settled in Bosnia, families whose last names show they were the Sephardim who had earlier lived in Italian cities. It is also known that after the fall of Buda on September 2, 1686, and Turkish withdrawal from it, a group of Jews—certainly Sephardic—arrived from that town in Sarajevo and settled there permanently. A similar case occurred much later, for instance, when the Belgrade Sephardic family of Mevorah came from Belgrade. Izrael Mevorah, the head of that family, was a Turkish military supplier, who together with Muslim exiles from Serbia moved from Belgrade to Bosnia in 1867, during the reign of Prince Mihailo Obrenović and the Muslim exodus from Serbian towns. The Turkish authorities granted to him as well as other refugees–muhajers, free land and a house in Bosanska Kostajnica, where a number of refugees found sanctuary… . Many other Sephardim from Serbia, Macedonia, Bulgaria, and Turkey also came to Bosnia and settled there permanently. Thus, along with the surnames cited by Dr. M. Levy in his well-known work Die Sephardim in Bosnien, which came out in Sarajevo in 1911, we can also find surnames that had not existed in Sarajevo or other Bosnian towns before. 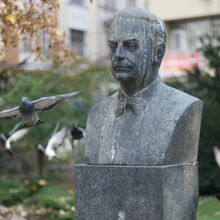 One such surname in Tuzla was Konfino; in Prijedor there was Mevorah (they had moved from Banja Luka); in Banja Luka, there were the Nahmijas, in Brčko the Almozninos, and in Sarajevo, the De Majos and Tuvis. All these families came from Serbia. 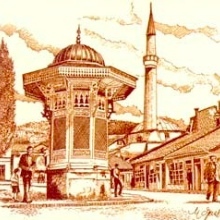 The Ovadijas and Alevis came from Bitola, the Uščuplijas, as their name itself tells us, hailed from Skoplje. Some families came from Bulgaria: the Samokovlijas from Samokov, the Kaponis from Ruščuk, the Elazars from Čustendil. The Kamhis and Levis arrived from Albania, and the Konfortis and Kavesonis from Novi Pazar. We should also keep in mind that this national community was very mobile, so during the past centuries, the Jews, moving out of Sarajevo, settled in almost all the towns of Bosnia and Herzegovina, some also going beyond its borders. Thus, as early as 1749, there was in Split the Jewish family Serraglio, which surely points to its relocation from Sarajevo and to the Italianized surname the family had continued to bear. This process continued in more recent time, with an even more accelerated movement of Jews to Split. While at the old Jewish cemetery there, dating from 1571, the old-time but now extinct families of Camposi, Cittanova, Fermo, Viterbo, Livorno, Lucena, Valenzino lay buried, Split witnessed the beginnings of trading activity by the Sephardim who had arrived from Bosnia, especially from Sarajevo, so that we could say that by the 1930s the Split Sephardic community had become an offshoot of the one in Sarajevo. The whole time the ties between the Jewish municipalities of Bosnia, Dalmatia, and Venice remained strong and deep-rooted. The Split harbor (skela), opened in 1592, contributed greatly to these ties. The skela was a sort of cargo center, where trading took place between Italian regions and Bosnia and where Bosnian Sephardim also played an important role. It is no wonder then that we sometimes hear in the Italian speech of the Italian Sephardim some familiar Turkisms, as in occasional fragments from the novel Il giardino di Finzi Contini by Giorgio Bassani, with its masterly descriptions of a Sephardic family from the city of Ferrara, an ancient Italian Sephardic center… . The first official census from Turkish times, taken in 1851/1852, shows that in Sarajevo at that time there were 1,074 male Jews, while in the entire Bosnia and Herzegovina, within its borders at the time, the total was 2,170. Soon a new era began, marked by the Congress of Berlin, but the Austrian censuses also show a constant growth of the Jewish population. In 1878, there were three thousand Sephardim, in 1895, 5,729, and in 1910, 8,219. A very high birth rate certainly contributed considerably to such rapid population growth among the Sephardim. In April 1941, there were altogether fourteen thousand Jews living within the borders of Bosnia and Herzegovina, of whom about ten thousand were in Sarajevo alone. A great majority of these were Sephardic Jews, whereas the Ashkenazim represented a minority of some 2,200 people. The Jewish community suffered enormously during the Second World War, which almost annihilated it. Material goods as well intellectual achievements, created for centuries, like temples and books, disappeared forever. Nine thousand Sarajevo Jews were deported to concentration camps throughout Europe; only 1,237 managed to return… In the interior of Bosnia, the conditions were similar, if not worse. Of 3,983 Jews, only 546 survived the horror of the Second World War.